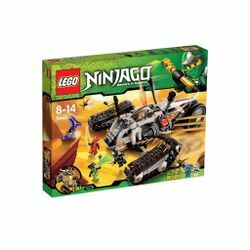 9449 Ultra Sonic Raider is a Ninjago set that was released in late May 2012. 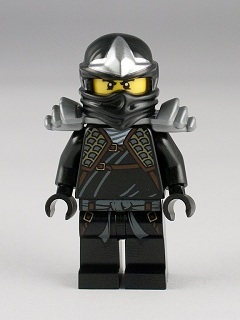 The set includes six minifigures; Pythor P. Chumsworth, Spitta, and all four ninja (Jay, Kai, Zane and Cole) in ZX form. 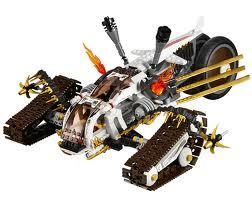 The Ultra Sonic Raider is a large white tank, piloted by two ninjas, that can convert to a special aircraft mode. This set also has multiple stickers which can be found on the side of the vehicle which displays some metal, and near the cockpit which display the two golden dragon symbols of earth, fire, lightning, and ice. The tank has two black treads in the front and a large black wheel in the back. Next to each tread is a large, gold flick-fire missile. Also, one row of golden sai daggers is attached to each side of the front of the tank, totaling 14 golden sai daggers. The four Golden Weapons of Spinjitzu can be attached to the front of the vehicle next to the bottom cockpit. This cockpit is only able to fit one ninja, while in the television show, two ninja should be seated there. This part of the vehicle is meant to come off of the top of the set leaving one cockpit below and one attached to the upper half. One ninja is able to be placed there, while in the television show, two ninja can be placed there. The flying part of the set also contains stickers which can be placed on either side of the second cockpit and show the other two golden dragon symbols. At the back of the vehicle, there is a small cage, meant to be a mini jail to put captured snakes in. In the vehicle's middle are two flame pieces that fit into the centre of two chrome black Spinjitzu crown pieces that can be used for the Ninjago spinners game. Two adjustable speaker cannons are located on the sides of the removable, flying part. On each side of the Raider, at the back, are three large golden blades, also found in 9442 Jay's Storm Fighter, 9443 Rattlecopter, 9448 Samurai Mech, 6231 Speeda Demon, 70503 The Golden Dragon, and 70505 Temple of Light. The minifigures included in this set are Kai ZX, Zane ZX, Jay ZX, Cole ZX, Spitta, and Pythor P. Chumsworth. 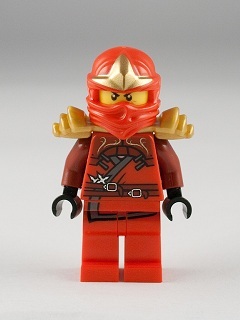 The Ultra Sonic Raider is the first Ninjago set to include all four of the Ninja and the only set that includes Pythor. 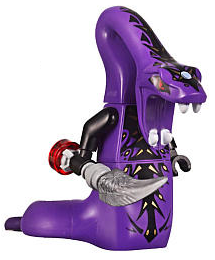 Although Pythor was not around when the Ultra Sonic Raider was built in the television show, he is exclusive to the set. However Spitta was around but he was in the Fangpyre tomb with the rest of the remaining Serpentine at the time. The set also includes The Four Golden Weapons of Spinjitzu. Kai ZX:Kai's ZX variant has red legs printed with the bottom of a tunic, and a red torso (with dark red arms and black hands), printed with a tunic, dark red armour, and a dark red belt (with an unidentified silver tool in it). He wears around his neck a sheath-like object, which katanas can be stuck into. His face is he same as that used in all his prior variations. 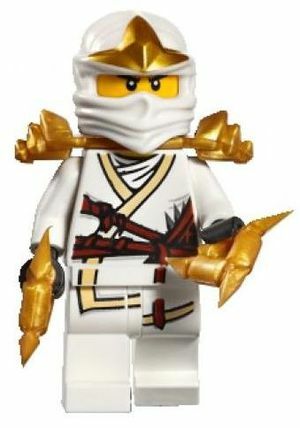 Zane ZX:He still wears mostly white, but in ZX form he also wears golden shoulder armour which can hold two katanas in the back. Zane's face is the same as always, but his torso has been updated with the under-robes being white, instead of grey, and having tan embroidering, as well as a printed design of some lightweight armour. On the back is the golden ice dragon symbol, which is absent from the front. Zane's torso pattern continues onto his legs. Cole ZX:He still wears mostly black, but in ZX form he also wears silver shoulder armour which can hold two katanas in the back. Cole's face is the same as his previous versions. On the back is the golden earth dragon symbol, which is absent from the front. Cole's torso pattern continues onto his legs. 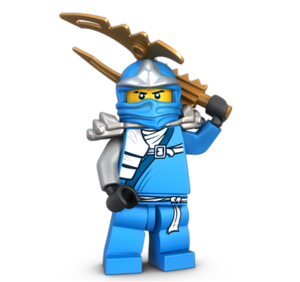 Jay ZX:He still wears mostly blue, but in ZX form he also wears silver shoulder armour which can hold two katanas in the back. Jay's face is the same as his previous versions. On the back is the golden lightning dragon symbol, which is absent from the front. Jay's torso pattern continues onto his legs. Spitta:He has a dark green and lime green head, which is identical to Mezmo's except for the color and eye detail. Like most Venomari, he has four yellow eyes. 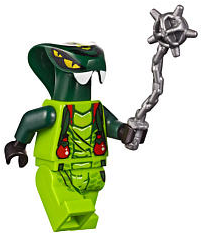 Pythor P. Chumsworth:Like the other Serpentine generals, Pythor has a snake tail instead of normal minifigure legs. He is coloured in purple and has a black stripe going up the front with yellow triangles coming off of the sides and pointing to the lower-left or the lower-right, depending on which side they sprout from. Pythor's torso continues the same pattern, but there is a light blue circle in the center of his chest, the symbol of the Anacondrai. Pythor has a long purple neck that curves backwards and his head rests right above the start. He is exclusive to the set. According to the show, the The Great Devourer is awakened and devours Sensei Wu and Pythor before chasing after the ninja. The Great Devourer destroys the Destiny's Bounty, then ninja rush to Ed 'N Edna's Junkyard, where Kai shows the other ninjas a set of blueprints that show a vehicle of massive size. They use the Tornado of Creation to build the Ultra Sonic Raider from junk found in the scrapyard. The Raider is damaged by the Great Devourer's tail. The set's story tells that Pythor is alive. In Double Trouble, Bizzaro Jay kisses Nya, who is working on the Ultra Sonic Raider, in order to steal the keys. Later, it was repaired by Nya in Ninjaball Run. As soon as the race begins, the Ninja find that the Raider won't operate due to Gene and Brad Tudabone tampering with it before the race. At the starting line, the Ninja succeed in fixing the Raider and join the race again. To ensure he wins, Lord Garmadon wishes for a divide that the Ninja will not be able to cross. Although hope seems lost, Kai uses the lever that Nya installed which causes the Raider to grow wings and cross the divide. Both Lord Garmadon and the Ninja fight for the lead, but the Ninja win by placing a piece from Ed Walker and Edna Walker's car crossing the finish line first. Pythor P. Chumsworth is exclusive to this set. This is also the only set to include Spitta, excluding his spinner. This is the first set to include Zane, Kai, Jay and Cole all together. This set includes an orange brick separator. In the TV show, all of the ninjas (Excluding Lloyd) can fit in the vehicle. Pythor cant fit in the jail due to his tailpiece's length. Spitta is the only minifigure in the set that is suitable to be put in the prison cell. This is a description taken from LEGO.com. Please do not modify it. (visit this item's product page) Track down Pythor and the fang blade with the terrain-defying Ultra Sonic Raider! Separate the flying vehicle and take to the skies! Load up all 4 Spinjitzu masters! Throw the snakes into the mobile prison! Facts about "9449 Ultra Sonic Raider"
Track down Pythor and the fang blade with the terrain-defying Ultra Sonic Raider! This page was last edited on 19 October 2016, at 21:35.